One theme of my blog is how the 31 Abbott districts aren't the 31 poorest districts in New Jersey. 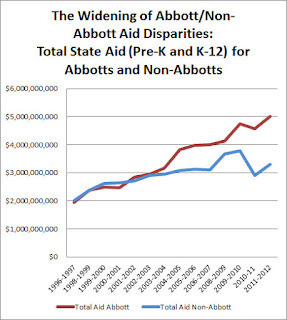 The relevance of this argument is that by forcing the state to maintain Abbott aid privileges, the Education Law Center and New Jersey Supreme Court are exacerbating funding inequities by allowing less-poor Abbott districts to get tax relief and state benefits that New Jersey's poorest districts and poorest children don't get. developed - often pointing to Hoboken and Jersey City's gentrification. However, the unfairness and arbitrariness have always been there. The Abbott districts have, as a class, never represented New Jersey's poorest districts. Yes, in 1990, most of the future Abbott districts were underequipped, understaffed, and had inadequate facilities, but so were numerous other non-Abbott districts. Governor Jim Florio was rightfully deeply concerned about the divide between New Jersey's poorest and richest and thus in May 1990, proposed a law called the "Quality Education Act" that would have cut aid for affluent districts, made them pay for teacher pensions, raised taxes overall, and used the savings and tax increases to increase aid for all middle-income and poor districts. Unlike the later Abbott regime, Florio's original Quality Education Act was sensitive to the state's budget situation and would have brought the poorest districts up the 60th percentile in spending, not to effectively the 90th percentile as the Abbott II decision ordered, but, critically, Florio's original QEA also made no distinction between urban poor districts, suburban poor districts, and rural poor districts and treated all poor districts equally. 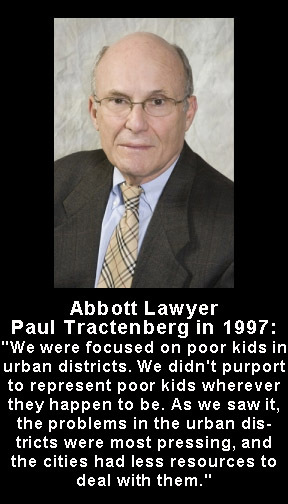 Unfortunately for the future of funding fairness, Chief Justice Robert Wilentz and the New Jersey Supreme Court intruded in June 1990 with the Abbott II decision, which gave special aid rights to urban poor districts that were not to be shared by non-urban poor districts or even many densely-populated small districts that any reasonable person would nonetheless consider urban. 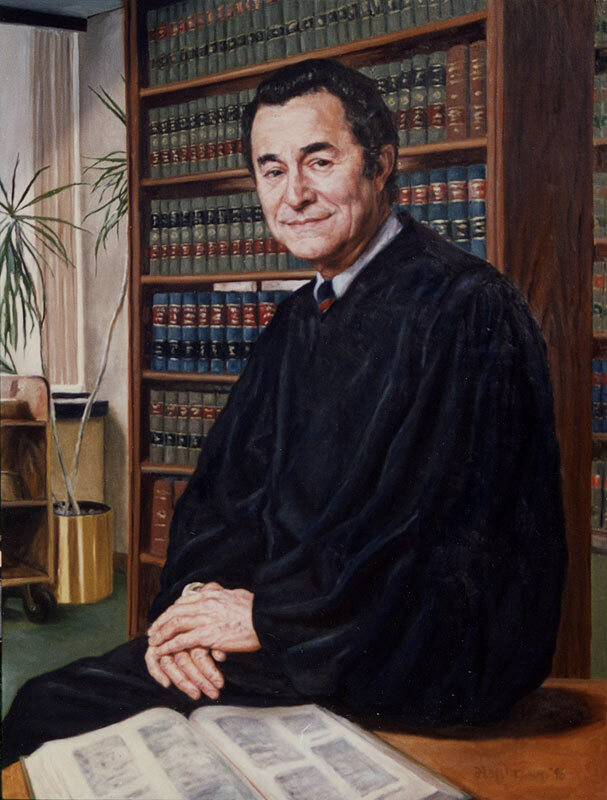 The NJ Supreme Court constitutionalized special funding rights for a starkly-defined list of urban districts and thus superseded the original intentions of Jim Florio and overrode common sense. Even if someone believes that an urban poor district is needier than an equally poor non-urban district, the Abbott approach created a sharp line between the 31st neediest district and the 32nd neediest district. 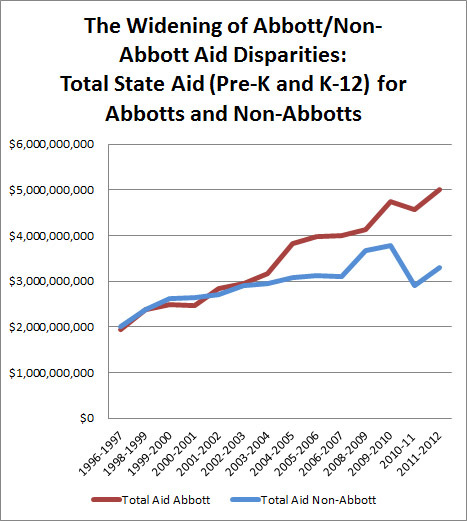 As Abbott privileges grew during the 1990s and the state's budget situation worsened after 2001, what was originally an aid ledge grew into an aid cliff. The Education Law Center had gathered 20 figurehead plaintiffs for the Abbott lawsuit, one of whom, Raymond Abbott of Camden, gave his name to the lawsuit and the class of districts created from it. The 20 student plaintiffs, however, only were from four districts. The "Abbott Remedy" however, was meant to apply to all urban poor districts. 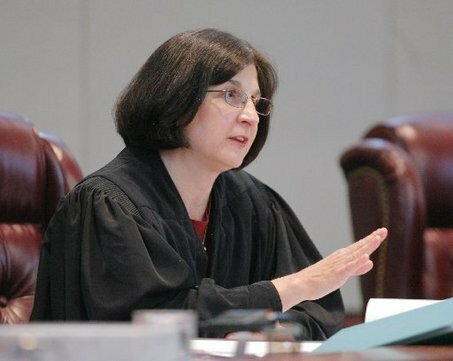 The NJ Supreme Court gave the legislature some leeway in what districts would receive the Abbott remedy, but it created the guidelines and gave its own list of what districts should receive the "Abbott Remedy." overlap of districts who had DFG A or B classification by the Department of Education and "urban" municipality classification by the Department of Community Affairs (minus Atlantic City). The problems were that the source material was outdated and the classifications for DFG status and "urban municipality" status were themselves, inevitably, arbitrary. The DFG classification the Wilentz Court "used extensively" was made in 1984 and based on 1980 census data. By the time the Abbott II case was written in 1990, the DFG classification had become out of date and there were certain districts who had fallen socioeconomically in the preceding decade and others who had risen. a greater number of districts. Yet DFG classification was not the sole determinant of Abbott status. If it had been, the Abbotts might have just been all the districts in DFG A, but the NJ Supreme Court left off 35 (1980) DFG A districts, including impoverished/low-tax base towns including Buena Regional, Pinelands Regional, Bass River Township, East Newark, Paulsboro, and National Park Boro. The second half of Abbottization was to have been classified as "urban" in early 1980s by the Department of Community Affairs. The purpose of this Department of Community Affairs classification was originally to determine what municipalities could get special urban aid. Since state aid was involved, the classification process was political, the definition expansive, and some towns were classified as "urban" a reasonable person would call "suburban" or "rural" such as Pemberton, Millville, and Howell. There appear to have been size minima and public housing requirements for Department of Community Affairs "urban status," so very poor and relatively dense DFG A and B districts like Little Egg Harbor, Beverly City Woodlynne, Lawnside, National Park and East Newark were excluded from the Abbott list. 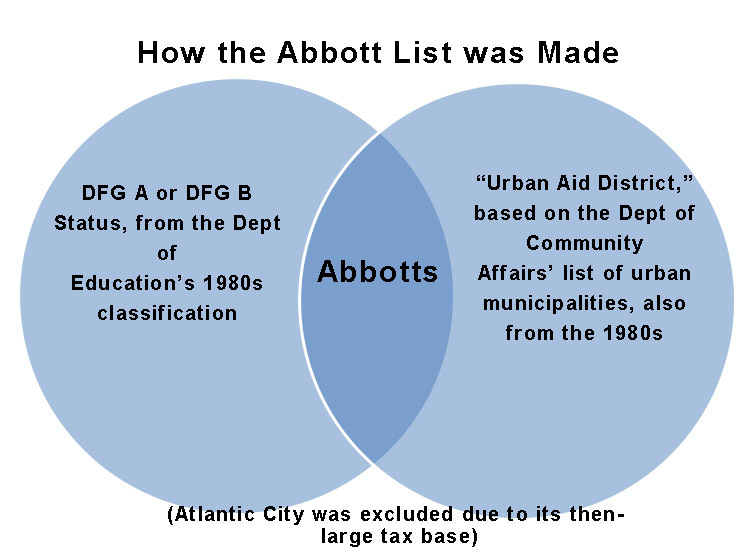 Since the NJ Supreme Court embedded the Department of Community Affairs list into Abbott classification, the Abbott list automatically excluded small districts. In his sweeping Abbott II holding, Chief Justice Robert Wilentz had wrote that he was ordering money to urban poor districts because they are the districts where society is "failing abysmally, dramatically, and tragically." live in poverty. 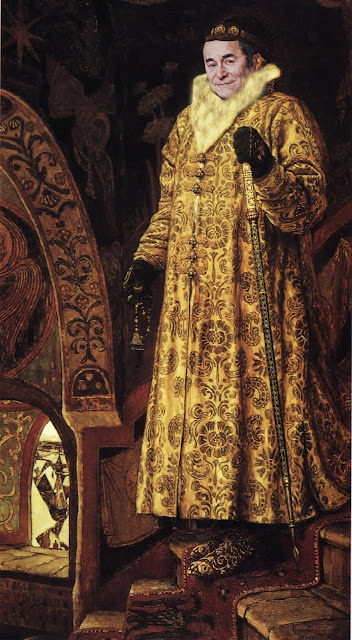 Their cities have deteriorated and their lives are often bleak. They live in a culture where schools, studying, and homework are secondary. Their test scores, their dropout rate, their attendance at college, all indicate a severe failure of education. While education is largely absent from their lives, we get some idea of what is present from the crime rate, disease rate, drug addiction rate, teenage pregnancy rate, and the unemployment rate. Yet this description did not fit all of the "urban" towns that became Abbotts. Journalism has always been sparse on the medium-sized Abbott districts, so this Philadelphia Inquirer article from 1990 about Burlington City and Pemberton, "Life On The List Of Poorest Schools," is fascinating because sheds rare light on how haphazard the Abbott list list was from the start. But visits to schools in the Pemberton and Burlington districts, and interviews with teachers, administrators, students and parents there, found a different picture. Although everyone looked forward to the prospect of more money, hardly anyone said the two school systems were so bad off they needed the state to come running to the rescue. According to the Inquirer article, in 1990, Burlington City was "mildly depressed urban area," but was able to spend above the state's average and had a declining student population, so hardly one of acute need. Pemberton Township was entirely rural to a reasonable observer, had stable families and lacked the "environment of violence, poverty and despair" that Wilentz said dominated in the seven cities that he did purport to study. Both Burlington City and Pemberton's officials welcomed more money, but they disagreed that they were providing anything other than a "thorough and efficient education." "We're included in this decision because there's a limit on our (taxable property) and because of the demographics of the town," said Johnson, Burlington's assistant superintendent. "This is not based on our performance or the education we provide." 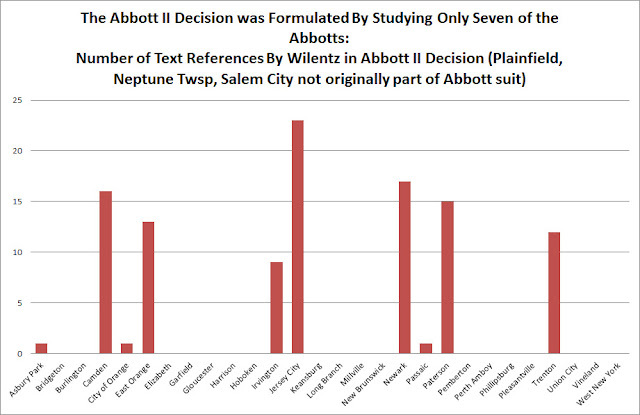 In justifying why Wilentz was excluding so many poor districts from the "Abbott Remedy," Wilentz said of the other DFG A and B districts "their socioeconomic status is not as compelling; furthermore, there is no direct substantive evidence on this record of their failure to provide a thorough and efficient education." Society wasn't failing in Pemberton and Burlington City and neither were the school districts. In Pemberton, administrators took offense at the suggestion that their academic performance was sub-standard. "The thing about us," said High School No. 2 principal Robert Holmes, "is that we do a lot with a little." A few statistics illustrate the gap between the academic programs in the deeply depressed city schools, and at Pemberton and Burlington. At Camden's Woodrow Wilson High, for instance, the dropout rate was 58 percent, according to a 1980 state study; at Newark's Central High, the rate was 55 percent. At Pemberton, last year's official dropout rate was 5.3 percent; Burlington City's rate was 3.7 percent - better than the state average of 4.9 percent. Last year in Jersey City high schools, 54.6 percent of freshmen passed the state-mandated math proficiency exam, which all students must pass before they can graduate; in Camden the passing rate was 53.6 percent. At Burlington City last year, 87.3 percent passed the math exam; at Pemberton, 84.2 percent passed. so one size fits all. participate fully in society, in the life of one's community, the ability to appreciate music, art, and literature, and the ability to share all of that with friends." Wilentz wrote and yet one Burlington City mom was very proud that Burlington City already offered art and music. "You can't equate us with Moorestown, it's true, but you can't equate us with Camden either. Our school system is excellent in my mind. The kids have music once a week, and art once a week, and there are computers in all the classrooms. We don't lack for anything." The reason that Wilentz language didn't fit Pemberton and Burlington City is that Wilentz and the New Jersey Supreme Court never studied Pemberton and Burlington City. Their whole research was focused on only the seven most impoverished districts: Camden, Trenton, East Orange, Irvington, Jersey City, Newark and Paterson. Wilentz then just made an assumption that the (then) other 21 districts shared the same characteristics. we have absolutely no doubt, based on the record, that the twenty-eight urban districts that are the subject of our remedy share the educational characteristics and problems of the seven urban districts mentioned above." The fact that Wilentz and the NJ Supreme Court only studied seven of the Abbotts reveals another fiscal injustice of Wilentz' "Parity Plus" doctrine since the "remedy" that might have been necessary for Newark wasn't necessary for Pemberton. Pemberton and Burlington City should not have become Abbotts based on demographics. Hoboken's students, on the other hand, probably qualified demographically based on pure poverty percentages, but there were proportionally very few of them relative to Hoboken's $1.6 billion tax base and had more up-to-date data been available, Hoboken would probably have been excluded from the Abbott list. In the 1980s Hoboken had very low performing schools, but Hoboken's tax base was already strong and its schools well funded. In 1989 Hoboken had a 1.11 school tax rate, which was not even among New Jersey's 100 highest. First, even at its rock bottom, Hoboken was never a demographic or tax-base peer of Newark, Paterson, or even Jersey City. 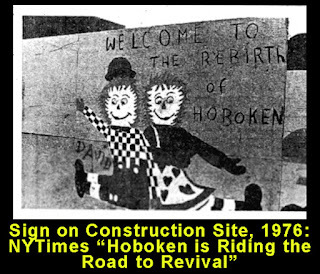 Hoboken always had a non-Hispanic white majority and as early as the 1970s, Hoboken was gentrifying. Even in 1979, before gentrification became intense (or the word "gentrification" was used), Hoboken's schools were well funded with local tax dollars and state aid. "Politics has been the mainstay of the school system for 40 years. The chief administrative jobs have always been political plums, and that does not lend itself to a good educational system." Hoboken's gentrification heated up in the 1980s. By 1985, managing growth and affordability was the dominant issue in the mayoral election. OF the many issues in last spring's mayoral election campaign in Hoboken, none was as crucial as the city's unparalleled record of revitalization. Voters turned out Steven Cappiello, who for a dozen years had scrambled to replace outdated factories and rundown tenements with new condominiums. In his place they elected Thomas R. Vezzetti, who shouted through a bullhorn on street corners that uncontrolled growth had displaced residents and benefited the rich at the expense of the poor. By 1987, the New York Times covered a fight between yuppies (using that word) and working class Italians over the use of fireworks during Italian festivals and referred to Hoboken's "dramatic, painful gentrification." The Times said Hoboken was "once predominantly [a] blue-collar city. During the 1970s Hoboken's population fell by over 3,000 due to displacement and from 1980 to 1990 that process accelerated. Despite Hoboken's condominium boom, its population fell by over 9,000 from to 42,460 to 33,397. Indeed, according to that NYTimes article, the yuppies found the Hoboken school system lacking and were impatient that gentrification wasn't total, but no one cited a lack of funds for the system. Even as some families leave, real-estate values remain high, though there is a glut of new condominiums and prices have leveled off in the last year, as in much of the metropolitan region. On the side streets off Washington Street, the main strip lined with sidewalk cafes, restaurants and fancy shops, brownstones that sold 15 years ago for $30,000 are now worth $300,000, Over the last 15 months, 1,500 new studio, one- and two-bedroom condominiums have come on the market and have attracted another new population of young professionals to this once predominantly blue-collar city. Education Law Center: Abbott Reform Never! One reason the Abbott list was so unfair at its edges is that the Abbott II decision came out in early June and the legislature has to finalize the budget by June 30th. Abbott II's implementation legislation, a modified Quality Education Act and its significant tax, pension, and aid changes, was thus passed in a four week legislative blitzkrieg that violated multiple norms of democratic government and quickly became the most hated law in modern New Jersey history. The legislature added Plainfield and Neptune Township (then DFG C) to the Abbott list, bringing the total to 30, but made no deletions from the list that Judge Wilentz had suggested. 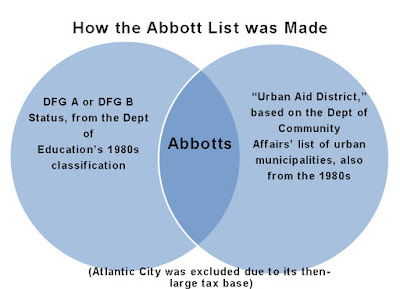 By the mid-2000s, after years of flat-aid for non-Abbotts, there was some loose talk from Republicans of removing Garfield, Burlington City, Pemberton, Gloucester City, Millville,Vineland, Harrison, Hoboken, Jersey City, Long Branch, Neptune Township, and Phillipsburg from the Abbott list since by the mid-2000s they either had decent tax bases, their students were not among NJ's poorest, or both. Yet to this moderate proposal that continued Abbott spending for the poorer Abbotts, the Education Law Center screamed "NO." "It would also roll back historic gains in educating thousands of poor and minority children, and bring back New Jersey’s shameful period of education inequality." Predictably, the Abbott list was unchanged and Hoboken retained its Abbott status. Instead, the Corzine administration and NJ legislature ignored NJ's budget and pension problems and (with some exaggeration) Abbottized all poor and working-class districts. Even though SFRA was an attempt to help districts who were as poor as almost as poor as non-Abbotts the Education Law Center stood athwart justice yelling "STOP." David Sciarra called SFRA "a major setback for children in both the high-poverty, urban districts but also in the higher-spending districts." Sciarra said that in September 2008 that SFRA was forcing cuts in the Abbott districts, but when asked to name a specific cut, he could not. The Abbott List was Created Unfair and Has Become More Unfair Ever Since, When Will the State Do Taxpayers and Poor Non-Abbotts Justice? Wilentz was wrong about many things, but he was especially wrong to have "absolutely no doubt, based on the record" that all the Abbott districts merited the same remedy that Camden, Trenton, East Orange, Irvington, Jersey City, Newark and Paterson did. Perhaps most of the other 21 Abbott districts - like Bridgeton, Perth Amboy, Passaic, Elizabeth, West New York, and Asbury Park - could be classed with Camden, Trenton etc, but not Long Branch, Neptune, Pemberton, Burlington City, or Hoboken. It was unjust to exclude some of New Jersey's poorest communities (Buena, Pinelands Regional, Woodlynne, East Newark, Fairfield etc) because they were too small to be classified as "urban" on a list whose qualifications were inevitably arbitrary. Had the Abbott II court case been decided after the 1990 census, Pemberton and Neptune would not have been Abbotts because they were classified in DFG CD after 1990. The critics of Robert Wilentz always objected to the fact that he lived on the Upper East Side (of Manhattan). Wilentz' defenders said his residence was irrelevant, but perhaps it was since had Wilentz known New Jersey better, perhaps he would not have advised treating Pemberton the same as Newark. Given that the Abbott list has become even more unfair in the last few years, the Education Law Center's threats to sue the state again over Abbott construction money and K-12 aid must be seen as reactionary moves that would foil justice, not advance it. Although I'm no fan of the NJ Supreme Court, responsibility to update the Abbott list is the legislature's and the executive branch's. When will they even try? If the Abbott List Were Updated, Who Would Be On It? Who Would be Off It?